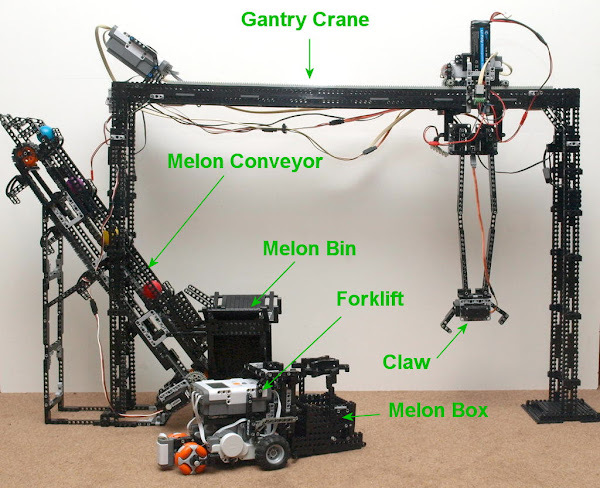 This is my Melon Factor Project, for the NXTLog FoodFactor Competition for May 2012 is programmed with RobotC. Part 1 of my project, involved transportation of the Melons using a Forklift Truck to transport the boxes of melons from the delivery depot to the processing plant. Part 2 consisted of a Gantry Crane and an Elevator to move the Melons from the Forklift Truck to the Elevator. Part 3 was the washing stage of the processing plant, receiving the Melons from the Elevator. I never reach Part 4 of this project, the 'Melon Sorting Facility' as time defeated me. The Forklift Truck' transports the goods to the factory. 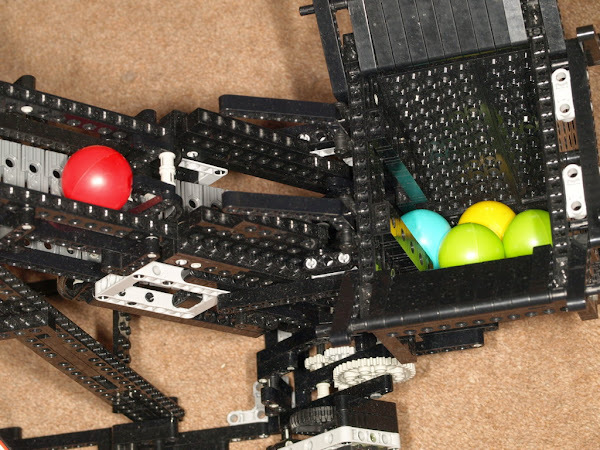 The goods are transported in LEGO® Models of the large open top, pallet type bins used to transport vegetables, such as potatoes, cabbages and pumpkins. The bins have hinged bottoms to unload the goods. The Forklift truck uses two NXT Motors to drive the front wheels, and a third lifts, lowers and latches the bin to the forklift. A set of two Rotacaster Omni-wheels preform as casters at the forklifts rear. A LASER Sensor is used to locate the position of the bin for loading. The 'Processing Plant' consists of a 'Gantry Crane' to take the Melon Boxes from the Forklift, and convey them to the 'Elevator Bin'. The Melon Box is then placed on the Bin and the Gantry Crane's Hook is released, which causes the bottom of the Melon Box to henge down, releasing the Melons into the Bin. The Gantry Crane then collects the empty Melon Bin, carrying it back to the waiting 'Forklift' where the bin is placed on it's forks for transport back to the Depot's 'Empty Melon Box' storage area. 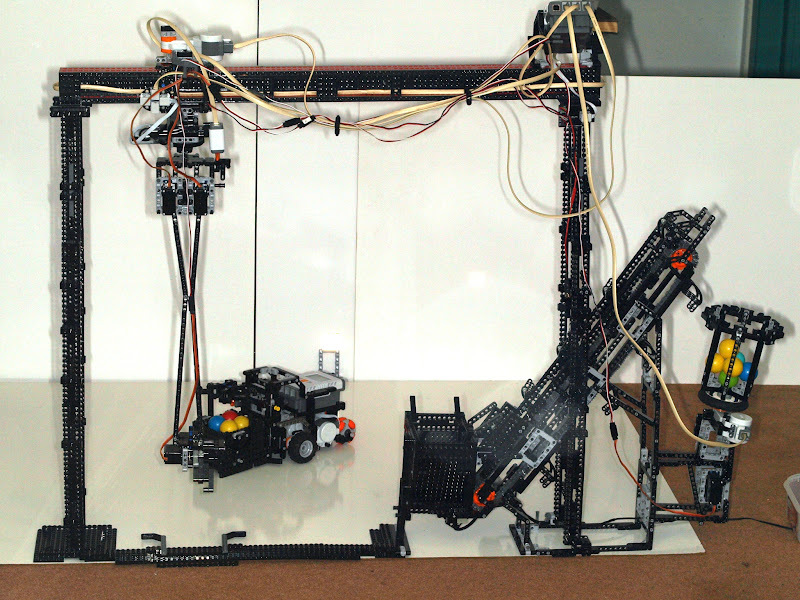 The 'Gantry Crane' and Elevator rely on a number of 'Radio Control type Servo Motors', controlled via a 'Mindsensors Mindstorms NXT, 8 Channel Servo Controller' (NXTServo-v2). 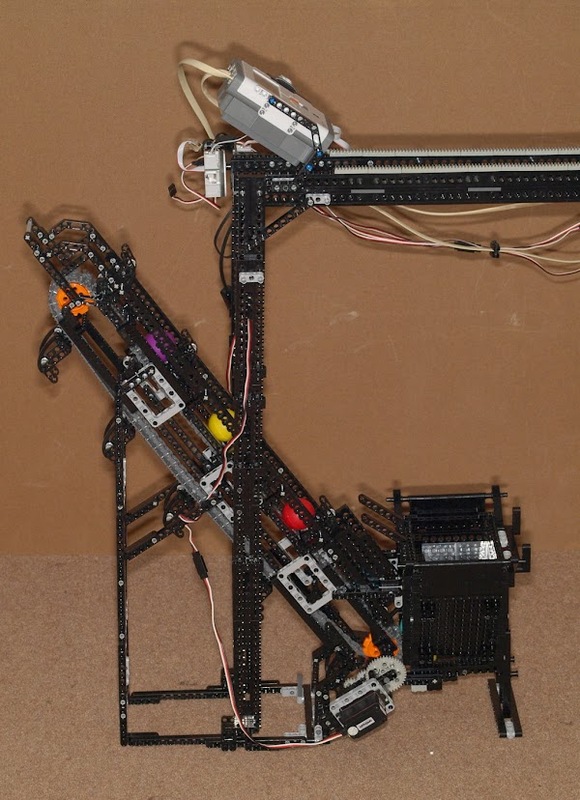 The Gantry Crane's Claw is driven by a single Radio Control (RC) type Servo Motor. 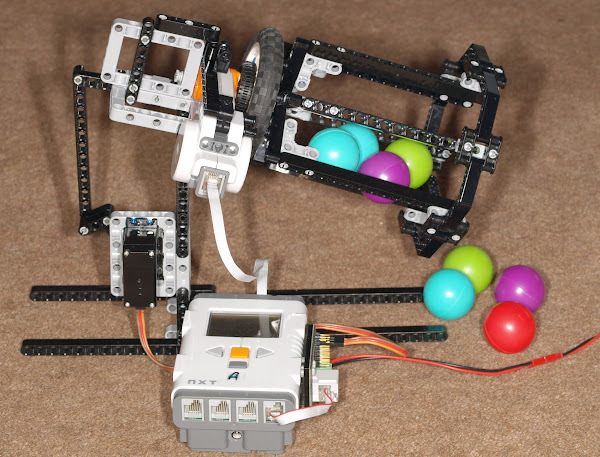 The Servo drives a simple gear train to both open and close the claw very reliably. Once the Claw grips something and there is power to the Servo it is very difficult to remove the object from it. 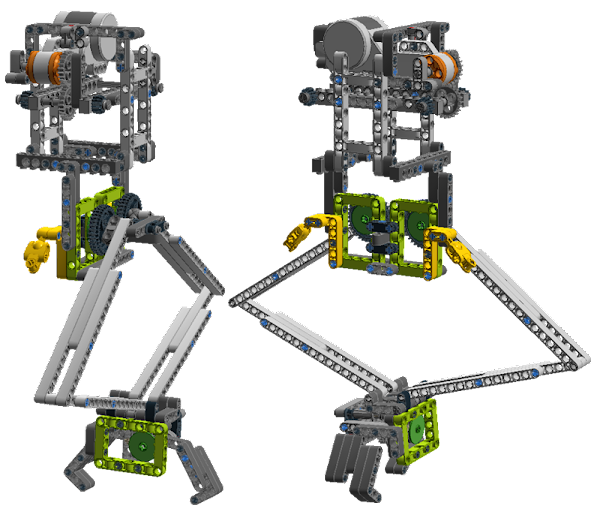 The Gantry Crane's Lift Arms are controlled via a pair of Radio Control (RC) type Servo Motors, working in parallel to raise the Crane's Claw. 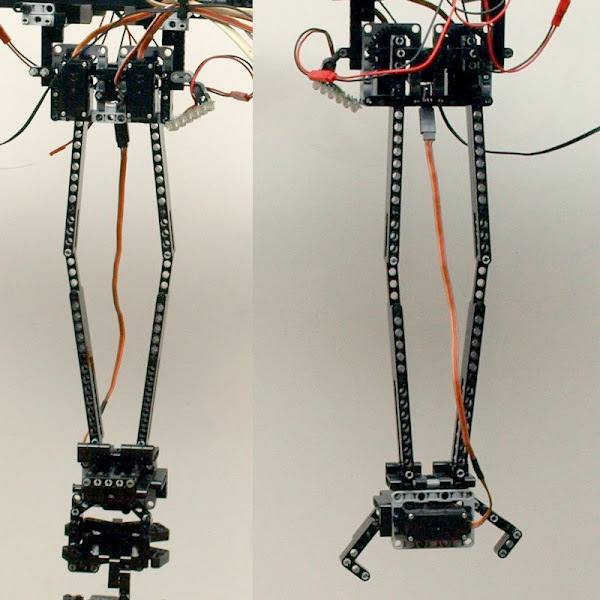 The RC Servos drive a 'Scissor Lift' type configuration to move the Crane's Claw up and down. This choice of mechanism results in very accurate positioning of the claw, as well as increase the load the assembly can control. I came across the Car Interior, 24 SMD LED Light Panel, designed for a 12V vehicle system on eBay for $2.80 each including P&P. In this case the modules are powered via a 11.1v Li-Po battery switched via the Mindsensors NXT Relay Driver. Attached either side of the 'Scissor Lift' mechanism is a pair of lights. A single light at a time only shines, depending on the direction of the Gantry Crane's travel. The lights are controlled via a Mindsensors NXT Relay Driver connected to one of the NXT's 'Motor Ports'. Depending on the ports output polarity, you can alternate which light is on. The Mindsensors NXT Relay Driver as the name suggest is usually used to drive a relay for switching high current loads. 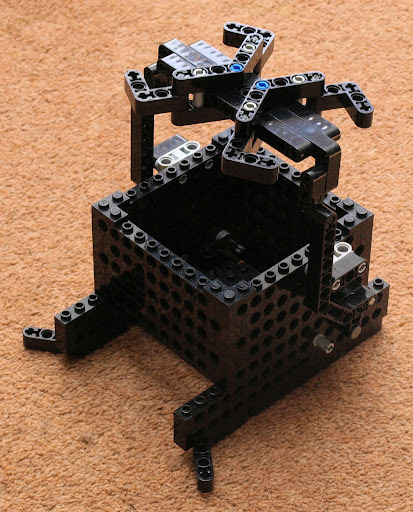 Gantry Carriage Mechanism is driven via a single Mindstorms NXT Motor. The Gantry Mechanism travels along a twin gear rack rail system. The Gantry Carriage Mechanism carries the Crane Claw mechanism along the Gantry. The Gantry is 800mm (2'8") long, and is 600mm (2') off the ground. With the Claw Arms fully extended the centre of the claw is 160mm (6.6") off the ground. Which means with the Melon Box on the Forklift with forks raised, the Melon Box's Handle is in the centre of the Claw. As I have received a pair of Mindsensors' GlideWheel-Ms, Power Functions Motor Controllers to Beta-Test. I decided to use one to control the 'Claw Rotation' The GlideWheel-M is a motor controller for Power Functions (PF) Motors that allows you to connect Power Functions Motors to NXT Motor Ports. Using the built in encoder, the GlideWheel-M, allows rotational control of Power Functions Motors. The Feed Bin and Conveyor System take the Melons up to the 'Washing Mechanism' for further processing before heading to the 'Quality Control Area'. The 'Feed Bin' is basically a box with part of the bottom and the centre of one side cut out. The Conveyor 'Drive Sprockets' are 500mm (1'7.5") apart. The Conveyor has a total of 10 'Mellon Grabs' to transport the Melons to the top, and on to the next processing stage. 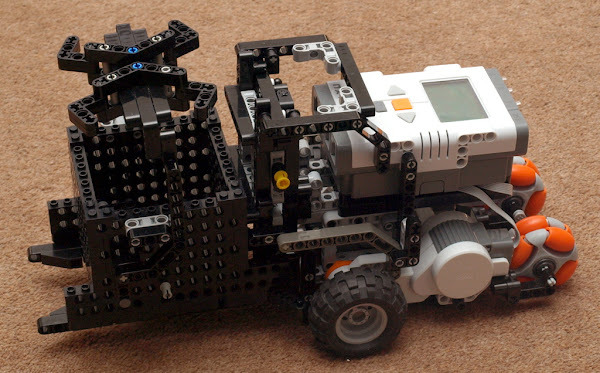 The conveyor is driven via a 'Continuous Full-rotation' Radio Control (RC) type Servo Motor, controlled via a Mindsensors 8 Channel Servo Controller (NXTServo) unit. The Servo drives the Convey Sprocket via a step-down gear train to 12:1 to acquire the correct amount of torque to drive the conveyor. This part of the 'Processing Plant' involves the washing of the Melons to remove dirt and other containments before been sent for 'Robotic Visual Inspection'. The 'Melon Washer' design is based on a Portable Concrete Mixer picture here with the wheelbarrow. The Mixer's Drum can rotate, spinning the Melons as they are cleaned with high pressure fluid being sprayed on them. The Mixer's Drum can also be tilted up to accept Melons for washing, and down to empty the Melons into the Melon Sorter's Hopper for further processing. The 'Melon Washer', as mentioned above can move on two axis. The first one involves spinning the Melon Washer's drum using a single NXT Motor. I could have used a Power Functions XL Motor, but the mount wasn't as secure as I would like. This motor just continues to spin, until the Melons are cleaned. 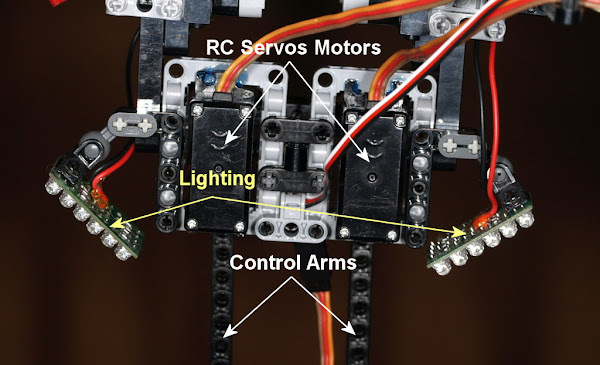 The second axis is controlled via a Radio Control (RC) type Servo Motor controlled via a Mindsensors 8 Channel Servo Controller (NXTServo). The RC Servo tilts the Melon Washer's Drum upwards to allow the Melons to drop in from the Conveyor System (Melon Factor – Part 2). Once the Melons are cleaned, the RC Servo tilts the drum downwards, to allow the Melons to empty into the 'Melon Quality Control' hoppers for further processing. Very impressive, good work on this one. I particularly like the gantry design, I've always been fascinated with that style of lateral movement. Just out of curiosity, what would you say was the biggest obstacle for this one? Meaning, what gave you the most problems?